← Will Cars Fly? Or Will They Just Get Smarter? Is civic tech the answer to rebuilding our cities? Is this a way to address rotting infrastructure, high unemployment and a history of failed governance? There’s probably no better case study to look at in America than Detroit. And that’s what this week’s Techonomy Detroit Conference, held at Wayne State University, was about. There are a whole range of apps that offer the opportunity to increase civic engagement and to improve not just the perception but the actual performance of local government. One example in Detroit is an app that allows citizens to report problems to the city from their smartphones. Things like gaping potholes or dead traffic lights get routed automatically to the appropriate parties in government and the person who reports the problem gets an immediate response and follow up. Policing is another area where technology can play a critical role. We’ve seen in recent weeks how body cams have been posed as a way to protect citizens against over-aggressive policing and to protect officers against unwarranted allegations. Apps that connect residents with the police department offer some promise in both making neighborhoods safer and in improving police-community relations. 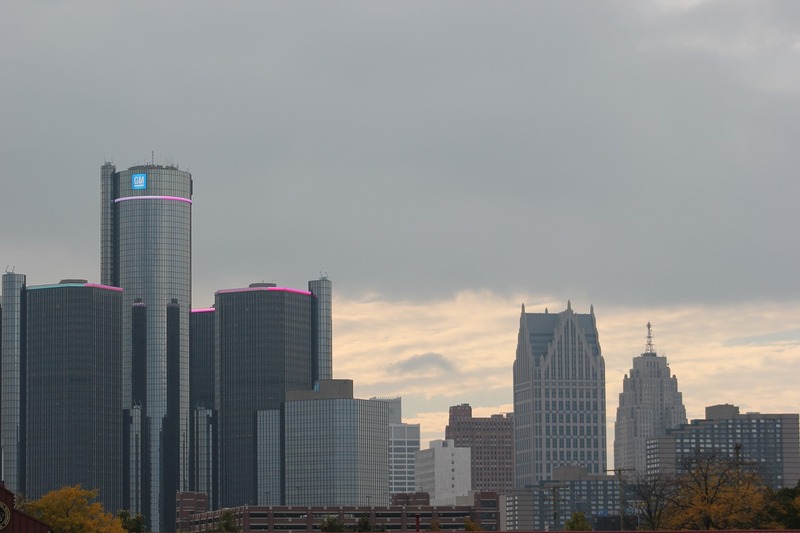 Like many post-industrial cities in the U.S., Detroit’s downfall was loss of jobs. It was particularly acute here because of the city’s dependence on a single industry, automotive. One conference speaker, Carl Bass, CEO of Autodesk, noted. “We aren’t going to reinvent factories with tens of thousands of jobs.” While the auto industry could indeed return to the Detroit, it will come back with robots doing what those tens of thousands of workers used to do. Detroit Mayor Mike Duggan talked about Detroit’s efforts to support budding entrepreneurs and would-be manufacturers. A program called Motor City Match puts entrepreneurs in touch with professionals who can help them with business plans, real estate experts who can help them find locations and architects and contractors who can advise on build-outs. During the conference a number of trends were identified that are encouraging the application of civic tech in urban areas. College graduates and young entrepreneurs have shown a preference for locating in urban areas. The cost of prototyping and getting started has been substantially reduced with the cloud and with 3-D printing. James Fallows of The Atlantic, who moderated one of the sessions, described what he called a reverse talent migration. Real estate costs in cities like New York, San Francisco and Los Angeles are pushing entrepreneurs and start ups to more affordable places, including Detroit. Fallows also pointed to the general “despair about national level politics” as something that is making Americans more interested in local level issues and government. This entry was posted in Technology and tagged cities, civic tech, Detroit, makers, manufacturing, technology, Techonomy. Bookmark the permalink. 17 Responses to Can Techies and Makers Save Our Cities? As someone who lives in Los Angeles, and used to live in NYC, it makes total sense to me that the high costs would eventually move many businesses to a new location. I’ve heard much about the economic and job troubles in Detroit. I do hope that they find a rebirth and it would be excellent if Detroit became a hub for the entrepreneurs of the future. Let’s hope that Detroit can attract young entrepreneurs. I would be a big boon to that poor city that lost so much because of one industry. An app to report issues with roads etc. I am one of those people ago report anything I see that is causing an obstruction or an eyesight. Policing to keep officers and the general public safe. As for robots – I oppose this. Ken, I hope that whatever plans they come up with, they will be able to revitalize Detroit. The problems with the auto industry created such turmoil for people – good paying jobs one day, no income the next. Heartbreaking. I really like the apps they’ve come up with – issues being directly to the right party and instant response to the sender – wonderful stuff. Many cities are going to face this sort of crisis in the future, though you’d never imagine it the way gov’ts behave. Swelling populations and cost reduction drives across all industries will not make for a happy future for many. Interesting glimpse into the forward thinking drive to build Detroit back up. It will be interesting to hear how it continues and develops. I would so love to see Detroit revived. Her demise was very painful to watch, even from a distance. So many factors, including the very high cost of labor. Love the apps idea and love that they are tyring to find ways to move forward. From all I have heard recently, Detroit really is on the move and in years to come might well be the city we look to as a model. I can see it being a city primed for entrepreneurs to take up residence and make the place vital and alive. They have been on the cutting edge before. Like the others, I am cautiously optimistic that these ideas or similar ones can help revive Detroit. Indeed, it is extremely expensive to live in New York City, but people do; some even raise children there. Hard to create all the features that attract urban lovers. As for me, I love the country, but I will settle for where I do live in a wonderful neighborhood with sidewalks and trees in Central New Jersey. The kind of apps you mentioned are widely used and really make a difference. Some communities use Twitter to enable citizens to report various things. It has the advantage that they have to be short to the point. Fascinating post, Ken. I’ve not yet been to Detroit, but hope it will be like a phoenix and find a way to rise from the ashes. Great idea to use technology to encourage citizen involvement and help improve conditions. The apps do seem like a wonderful techie idea to save our cities. I had no idea that this was happening in Detroit. Wish good news like this would make it to our depressing media reporting. Thanks Ken. A while ago, someone posted a house for sale in Detroit for $100, as long as the buyer was a writer! Artists are always struggling to find affordable housing, and once artists become established, neighbourhoods become trendy, attracting higher income citizens. That could be another solution for Detroit! I hope the ideas you presented can help save Detroit. Only concern is that is it too far gone? Who wants to go there to push innovative ideas if the city is lost. It is almost a self fulfilling prophecy, no one will go their because of the condition of the city, and the city will not get better until they do. So the mayor of Detroit is on board with Detroit’s revitalization – glad to see it. Here’s hoping that he and his City Council buddies have the sense to get out of the way and not hobble entrepreneurs and manufacturers with problematic ordinances and regulations. Ken, you always provoke me to think about brand new things and mull them over big time. My husband travels to Detroit for business and says there are parts of the city that are revived and others, well depressing. I like the idea of tech helping to improve lives–it’s not like we’re going to suddenly decide to live without it! Technology can definitely help in changing a city’s fate. The need of the hour says that the sooner we welcome technological advancements the faster can we see the change. And I am glad tat Detroit is marching on the right track. informative post, Ken. I like it!